An ant on a die. A game about being a frog and licking bugs. Made in 48 hours for Global Game Jam 2017. A shapeshifting alien falls to earth. Playtime: 5 minutes. Thanks for the writeup. It's always nice to get this kind of behind-the-scenes from a game creator. It’s possible to end up with 2 characters who can do nothing but pass their turns. Is that what happened to you? Almost - I was unable to do anything but pass my turns. The enemy nearly was too; I quit the game before finding out if they were going to draw an attack, since I judged that I wouldn't be able to win even if they did help clear my hand. Automatically discarding a card when drawing on a full hand does have the benefit that you don't need an extra UI button to trigger it. Was that also why you didn’t go for shields? Or was it just too convoluted to work with? I'll play again tomorrow and see if I can make it work. Reduce it to 2 damage, perhaps? That's 2AP for only one card advantage, but any card advantage at all should be 2AP (or some equivalent cost) and it's very easy to finish enemies off with 3 damage at once. I maintain that Healing Potion, and Fireblast, and indeed most of the 2AP cards are very powerful, if I can hang onto 2AP and the card for long enough to play them. Relying on that means that the most useful card in my deck is probably Rest. I haven't tried the shield-heavy strategy with Shields Up, Shield Bash, and Transmute Shields yet. It looks like it'll be tricky to get going. Too slow to end the game on turn 2 the way Fireblast does. But it clogs my deck with unplayable Shields so it's not a good slow-game plan either. I found a completely useless infinite loop where I play the 0-cost card that mimics whatever's on top of their graveyard, and that card in turn draws the top card of my graveyard, which of course is the one I just played. What a convoluted way of doing nothing at all! ... anyway! This game is lovely. A bit of graphical polish and some sound effects are all it needs. Card advantage is very important in this game, even more than in Hearthstone or Magic, since it's also your health. So it's odd watching early enemies play cards which do very little - Attack costs 1 AP, makes me opponent lose a card, and also makes me lose a card (the Attack itself). I'd often rather not play it and let my opponent come to me. The Necromancer especially - they'd sometimes play their Siphon card at a time when it did literally nothing. And in doing so, leave themselves with 1 card in hand, letting me kill them on my turn. This strategy worked pretty well until I fought the more control-oriented Blacksmith, and the fight dragged on until both our hands were completely full... of Shields. Some way to break the stalemate would be nice. In any case, this is a very neat design, good work! 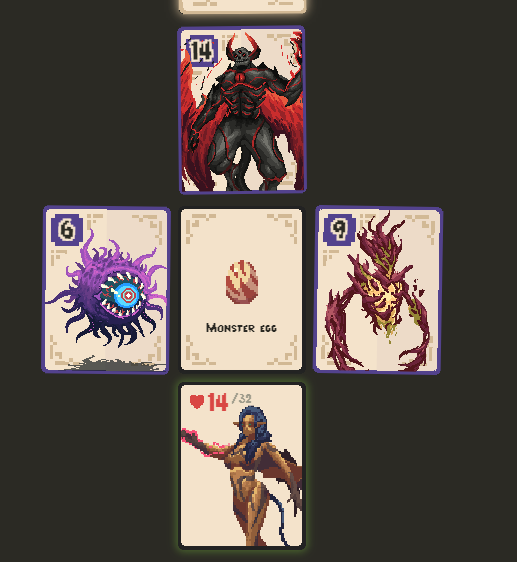 The cards slide around the screen very fluidly, and there's an interesting variety of abilities. The animations feel a bit slow sometimes - they were fine when I'm still learning the game, but once I knew what all the cards did I didn't need as much time to read them. As you can see, the rules are deep enough that it makes me ponder the balance and really think about which abilities are most useful. (2AP to draw 3 cards, you say? Gimme gimme!) And good thinking on _forcing_ me to pick a card during the draft - in Slay the Spire, I always found it hard to know when to turn down a card and keep my deck small. Keeping it a choice of "which of these three cards is best?" makes the decision clearer. An excellent game! It's really interesting figuring out which monsters should be fought for their loot, and which ones should be bypassed. I love the powerups you can get. The Carrot is particularly elegant - it's a constant trickle of HP even if you don't seek to activate it much, using it efficiently prevents you from looting monsters (since you need to move forward for that), and it lets you toggle the Invisibility Cloak on and off. The different characters really play differently, and show off how the items can work. I'd really like to see where else this game can go! Gorgeous art! The witch is very cute, and the pastel pink style really holds together. This game is a treasure to look at. It was always nice to see new ingredients, and guess what container they'd be kept in. I liked the later levels with the crystal and the weird orb. Randomising the ingredients each time is an interesting choice. It kept things unpredictable, and sometimes it was very easy to hit the time limit because the RNG gave me nearby ingredients five times in a row. It works well. Very challenging! I can never get much further than "download more ram" - guess I need some typing practice. Lovely music, and I like the way the character reacts to things on the screen. Je n'arrête pas de mourir sur le premier écran, et je ne comprends pas comment éviter les projectiles. Un peu de temps pour me familiariser avec les commandes sans être attaqué serait le bienvenu. Peut-être l'histoire du début pourrait faire partie du jeu, au lieu d'être donné dans un cut-scene? First impression: It would be more convenient if I didn't need to install it. Is there a way to run this game without an installer? A simple but interesting premise. The core mechanic of stopping in mid-air to form platforms is new to me, and you use it well. The different colours for each instance of yourself make it clear what is going on. The movement feels responsive and fast, but your past selves are very thin platforms and it's easy to accidentally walk off them. The jump arc is a bit odd, until I was used to it I couldn't jump with any precision. I liked how the game always gave me one or two more time-travels than was strictly necessary to solve the puzzle. It made it possible to recover from mistakes without starting the level over. That's good puzzle design, well done. Very clever use of low-rez sprites. It was fun to guess what an object might be before reading its description. I thought the pants were a pair of goggles at first. The minimal style stimulates the imagination, forcing us to look at an object and consider what else it could be - which was the point of the story, as well.